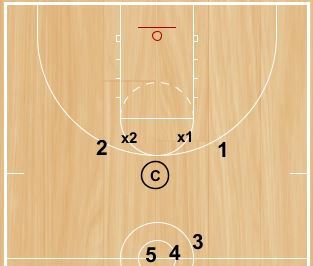 This drill is a part of Arkansas Women’s Coach Mike Neigbors competitive drills packet. He updates and sends out the packet from time to time in his newsletter. His basketball coaching newsletter is one of the oldest and best around. If you are interested in joining his distribution list, email me and I will pass your email address along to him. This drill is used in his college women’s program, but can be tweaked to fit the resources and personnel that you have available in your coaching situation. We use our men’s practice team as the offensive rebounder in this drill. If you don’t have a full team of men’s players, borrow a JV player from them for a drill. Worst case scenario pick your own best offensive rebounder (or two) and incentivize the drill for them somehow. Line up the rest of your team. The offensive rebounder has a football blocking pad in one hand. The defender will HIT the pad. The defensive rebounder must keep the offensive player from re-bounding the miss. If the offensive player can get the ball with a pad in one hand the defensive player must go again. We have ten players, so we put 8:00 on the clock. The entire team must get a rebound versus the offense to complete the GET ONE. After we complete GET ONE, we add a 2nd offensive rebounder. Now your team must GET TWO in a row before we rotate. Again, we go through the entire team. Then we add a 3rd… Now we must GET 3 in a row to complete the drill. If we can do that in 8:00 we have done a pretty good job. 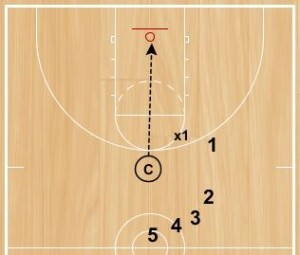 Once you consistently GET THREE, try to GET 4… We have yet to accomplish it in 8:00 but creates a ceiling to shoot for after the GET 3 becomes routine.